Local retailers from Fordham Road to Gun Hill Road and Jerome Avenue kick-started the holiday shopping season last weekend with late-night preparations and Black Friday bargains. Garl Robinson, the general manager of P.C. Richard & Son, the electronics emporium on the Grand Concourse and Fordham Road, said that he was up at 3 a.m. on Black Friday getting the store ready while customers were already forming a line outside. His main goal was to have every customer leave the store with a P.C. Richard bag in hand. Unlike most stores that have specific hours when their sales start and end, P.C. Richard & Son had sales all day long from 4 a.m. to 11 p.m.
For the first time all year, a huge line formed outside of the Modell’s Sporting Goods on Fordham Road for its holiday sales event, which started on Black Friday. Modell’s had hourly specials from 5 a.m. to 1 p.m., said Malvin Brown, an associate manager at the sporting goods store. In the days and weeks leading up to Christmas, the store will have different flyers throughout the holiday season filled with sales for shoppers. “We sent out flyers to our MVP customers with specials and sales,” Brown said. Conway did something differently this Black Friday. They gave away a free Snuggie — the blanket with sleeves advertised on television — to every customer who spent over $25 or more. “There were 372 Snuggies and all of them ran out by 4 p.m.,” said the store’s manager Zeleena, who declined to give her last name. In addition to their Snuggie special, Conway placed advertisements in newspapers and flooded the store’s windows with sales posters. The holiday sales and specials aren’t over yet. The Fordham Road Business Improvement District, a local non-profit group created to improving this commercial corridor, will kick off its sixth-annual Sparkling the Heart of Fordham, with a tree-lighting event on Friday, Dec. 3 from 6 to 8 p.m. in Bryan Park (East Fordham Road and East Kingsbridge Road). The event is open to the public and will include a special visit from Santa Claus with free gifts for the first 350 children as well as holiday music, a special performance by the Fordham University Gospel Choir, raffles, prizes, and giveaways. Nearly 80 BID businesses are participating in a special Holiday Shopping Promotion in which they will offer 10 percent public discounts. Shoppers must display one of the many BID sponsored newspaper advertisements, downloadable online coupons, or a MetroCard at the time of purchases. The holiday promotion runs Friday, Dec. 3 through Sunday, Dec.19. Businesses in the commercial shopping districts of Gun Hill Road, Jerome and Bainbridge avenues and Kingsbridge Road will also be offering their own specials and bargains. Ed. 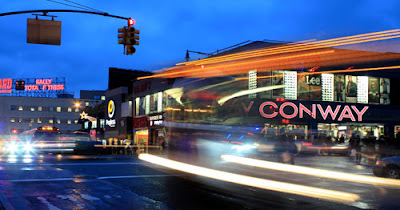 Note: For a list of all the participating stores in the Fordham Road discount program, go to www.fordhamroadbid.org. Ed. note: This article appears in the latest edition of the Norwood News, which is out on streets and online now.